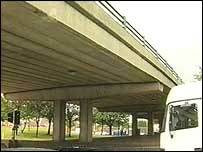 Plans to move Leicester's ring road to create a new pedestrian area have been scrapped because of a lack of money. The idea to re-route the road was part of the blueprint for the new Business Quarter in the city. Leicester City Council was applying to the Department for Transport to cover the cost of the road move. But the Leicester Regeneration Company (LRC) has been told the pot of money for the city project is likely to be much less than first thought. The modified plans are still going to include new public spaces with high grade pedestrian crossings. But planners felt that to wait for the go-ahead on moving the ring road towards the railway tracks could have met with a very long delay and put off potential investors. It is one of several projects in the St George's area of the city which are under way and are expected to generate 4,000 jobs. LRC is working to a plan looking at shops and businesses plus a new science park. The former Charles Street police station will be converted into offices and flats, and there will be a revamp for the Leicester Mercury building.